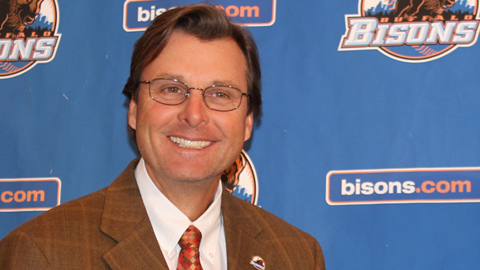 Buffalo, N.Y., January 21, 2011 -The Buffalo Bisons are pleased to announce that the New York Mets have selected TIM TEUFEL as the Herd's manager for the 2011 season. The World Series Champion is the Bisons 16th manager in the team's modern era. Pitching coach RICKY BONES, athletic trainer BRIAN CHICKLO and strength and conditioning coach KEN COWARD will all return for their third seasons with the Bisons. MIKE EASLER has joined the Mets organization and will serve as the Herd's hitting coach for 2011. Teufel, 52, is entering his 8th season as a minor league manager in the Mets organization and his first at the Triple-A level. He began his managerial career in 2003 with short-season Brooklyn of the NY-Penn League and earned a 47-28 record and a McNamara Division championship. Teufel then spent five of the next six seasons as a Single-A manager before joining Double-A Binghamton in 2010 (66-76 record). Last season with Binghamton, Teufel managed Mets' prospects OF Lucas Duda, OF Zach Lutz, RHP Jenrry Mejia, LHP Roy Merritt, C Mike Nickeas, OF Kirk Nieuwenhuis and RHP Josh Stinson before they made late-season appearances with the Bisons. For his career, Teufel has a 403-480 (.456) record as a minor league skipper. He joined the Mets organization in 1998 when he was named to the professional scouting department. He spent the 2001 and 2002 seasons as the Mets minor league infield coordinator. Teufel played 11 major league seasons from 1983-1993, including six with the New York Mets (1986-1991). He played 93 regular season games for the 1986 World Series Champion Mets and hit .444 (4-9) with a home run and an RBI in three games against the Boston Red Sox. Teufel was originally drafted by Minnesota in the second round of the June 1980 Free Agent Draft and played in parts of three seasons with the Twins before an off-season trade in 1986 brought him to New York. The infielder finished his career with three years in San Diego. Overall, Teufel hit .254 with 86 home runs and 379RBI in 1,073 career big league games. Bones has spent each of the past two seasons as the Bisons pitching coach. In each campaign, the Bisons have led the International League in complete games. Last year, the Herd pitching staff finished 2nd in the IL with 1,063 strikeouts, the second-highest single-season total in the Buffalo modern era. Prior to joining the Bisons, Bones spent 2007 and 2008 as the pitching coach of the Binghamton Mets (AA) of the Easter League. He joined the Mets in 2006 as the pitching coach for the Florida State League Champion St. Lucie Mets. Bones pitched 11 seasons in the major leagues with San Diego, Milwaukee, New York-AL, Cincinnati, Kansas City, Baltimore and Florida with a career record of 63-82 and a 4.85ERA in 375 games. He was an American League All-Star with Milwaukee in 1994 and won 10+ games in three consecutive seasons with the Brewers (11 -1993, 10 -1994, 10 -1995). Easler is entering his first season in the Mets organization. Since his retirement in 1988, he's served as the hitting coach for Milwaukee (1992), Boston (1993) and St. Louis (1999-2001). He joined the Lost Angeles Dodgers organization in 2006 as the hitting coach at Double-A Jacksonville and moved onto Triple-A Las Vegas in 2007. He split the 2008 season as the Dodgers hitting coach and the organization's minor league hitting instructor. Nicknamed the "Hit Man" during his 14-year big league career, Easler averaged .293 with 118 home runs and 522RBI in 1,151 major league games with Houston, California, Pittsburgh, Boston, Philadelphia and the New York Yankees. The outfielder was a National League All-Star with Pittsburgh in 1981 and was part of the 1979 World Series Champion Pirates team. Chicklo is entering his 3rd year as the Bisons athletic trainer and his 12th year in New York's organization. In 2008, he was named Pacific Coast League Trainer-of-the-Year while with the New Orleans Zephyrs. Chicklo graduated from Shenandoah University in 1995 with a BS in Kinesiology and earned an MS Degree in Sports Injury Management from UNLV in 1998. Coward is entering his 3rd year as the Bisons strength and conditioning coach. He is certified as a strength and conditioning specialist by the National Strength and Conditioning Association. He is also a Level One United States weightlifting club coach with the US Weightlifting Association. Coward owns an online personal training company named Total Human Elevation.